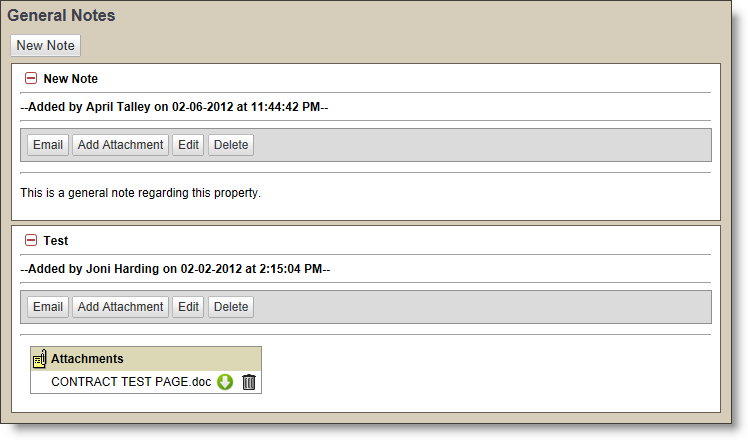 The Notes>General tab allows you to post general information into Broker Brain that is not property specific. 2. Click the New Note button. An Add Note screen will appear. 3. Type in your note, edit as desired, and click the green Add button. Notes can be edited, deleted, or emailed from here. You can also add attachments to a note. For more information on working with notes, see Notes (this will take you to the Properties>Notes section, but all the details on editing, deleting, attachments, etc., are the same). Notes added here will be displayed alphabetically, by subject.